Right of ways, roadsides, pastures, open areas, and row crop fields are all candidates for the RC4620. It handles brush up to 3″ in diameter, and has blade tip speeds up to 18,000 fpm. The gearboxes are rated at 250 HP and 210 HP, centre and wing respectively, and boast 20-spline, 1.75″ input shafts and 2.375″ output shafts. Our gearboxes come with a 7-Year Limited Warranty but unlike the competition, Land Pride pays parts AND labor for a full 5-Years! The main driveline is available as a Cat 6 Constant Velocity, wing drivelines are Cat 5. 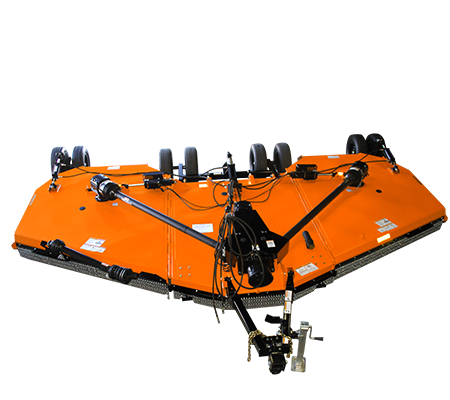 Rephasing axles allow for shorter axles which in turn leads to less weight on the tractor draw bar. Also included is a new diamond blade bar with an optional bolt-on stump jumper. Decks feature 1⁄4″ side skirts and smooth-top, 10 gauge decks.